Picture a nondescript place. It is dim but nowhere near quiet. People with eager faces fill the space and spill out onto the streets. Non-descript chatter and the sound of nonchalance fill the space. The room is brimming with wild anticipation. Then in one swift moment the hum of guitars cuts the murmurs into silence, and then transitions almost instantly into thundering excitement and blissful cheers. The air is electric with a sea of avid fans mouthing the songs that they’ve written. Three taps into the mic and the rest is history. 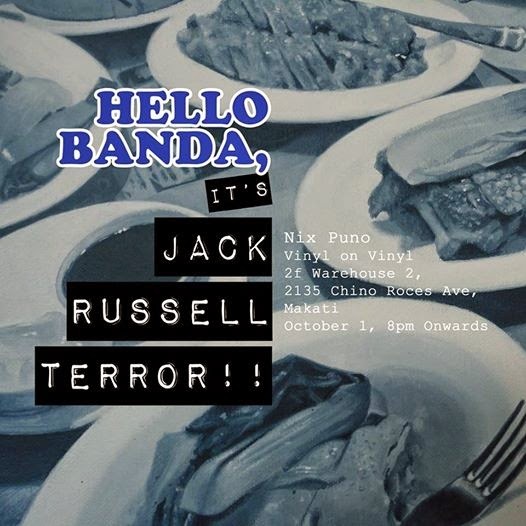 Hello Banda, It’s Jack Russell Terror!! celebrates the musicians that have carved their songs into the hearts of their audience, but in a way you least expect. Nix Puno goes past the spotlights, peels away the celebrity, and reveals the people behind the music, giving us a glimpse of life after the encore. Nix Puno humanizes the glorified musician, giving us a glimpse of what happens when the mics are off and the guitars are unplugged. He gives color to the cheeks to the idols that have filled our ears with music that transcends time. He reveals a certain dimension to them and gives us a glimpse of the life that goes beyond the stage, and into the experiences that make their music what they are. In Hello Banda, It’s Jack Russell Terror! !, there is no stage, there are no idols. Just a group of people, grabbing a bite to eat, and having the time of theirs lives.